Whether your family consists of two or twelve people, it’s important that you have a relatively informal space in your home where all of you can come together for recreation and relaxation. Because every family has a different idea of fun, designing a family room that’s not only visually appealing but also realistic and conducive to your family’s lifestyle is vital. 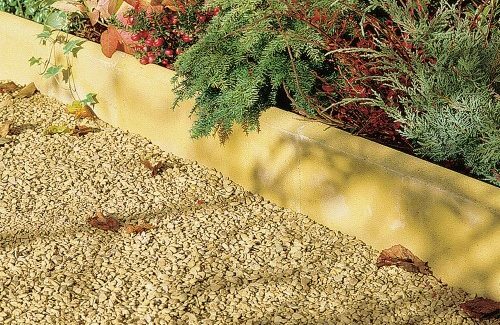 You’re bound to find at least one design out of the twenty amazing ideas detailed below that will be the perfect match for your family. There’s no reason to wait until summer vacation to enjoy the ambiance of the beach with your family. 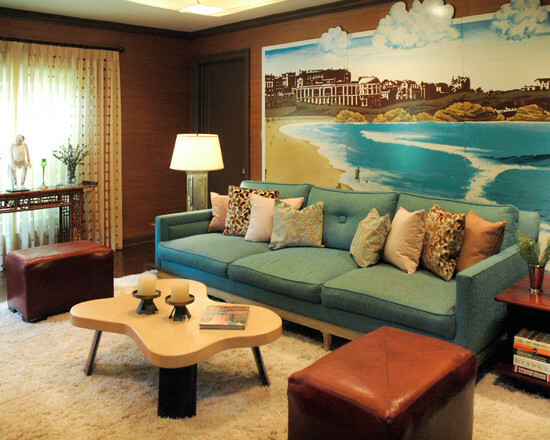 It’s easy to bring the coast to your family room with a beach scene mural that lines an entire wall, a couch the color of the sea, pretty plants, and a sandy beige carpet. 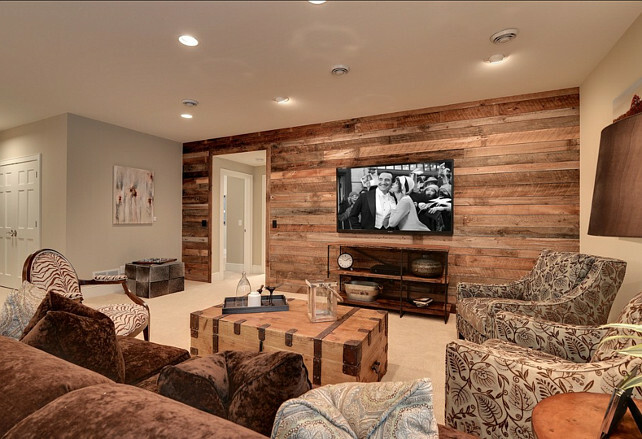 This family room uses a variety of natural materials and textures, as well as vintage Western movie posters, to create a rustic ambiance. Oak ceilings and walls, concrete flooring, and a stone setting surrounding the entertainment center make this cozy family room unlike any other. While some people love to cram their family rooms with lots of furniture and activities, others may prefer a more simplistic design. This sleek white and gray design is a minimalist’s dream. With bright orange curtains adding a pop of color, this room contains an element of surprise that doesn’t destroy its unassuming quality. A nature-lover’s dream, this family room maintains a fresh, botanical mood by allowing in natural light and keeping the walls and carpet shades of beige and tan. 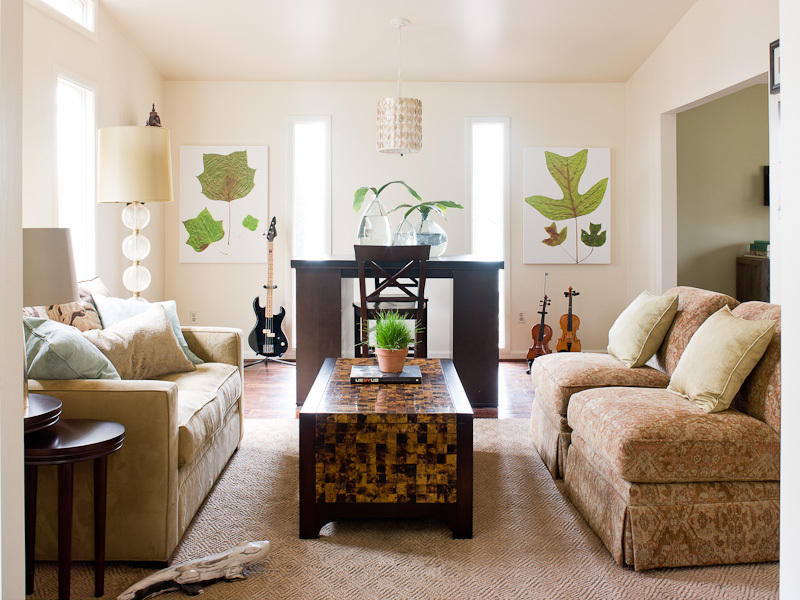 Leaf prints lining the walls and living plants scattered throughout the room add natural energy to the living space. Some of the best family memories are those that have been made over a classic board game. 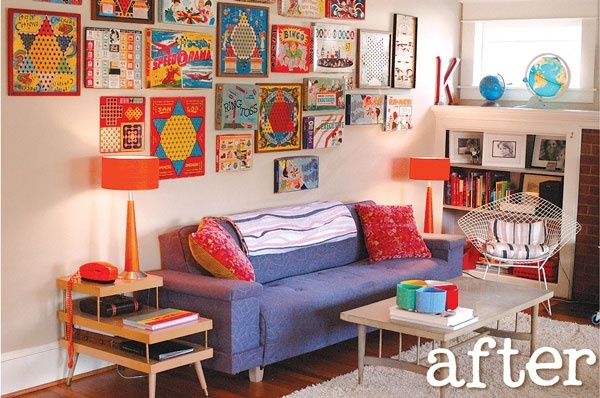 Colorful vintage board games aren’t just for entertainment; they also make excellent wall art in a family room! 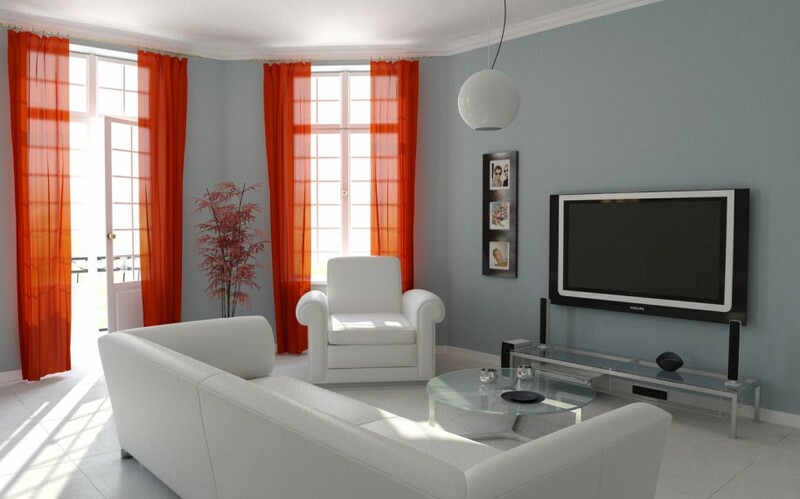 Neutral carpet and walls play off the more colorful components of the room, such as the orange lamps and bright board games, to create harmony and balance. This contemporary family room certainly puts family first. Instead of filling the walls with modern art, this design keeps the focus on the kids with gigantic canvases featuring their adorable mugs. Room embellishments in neutral tones take the back seat and ensure the kids are front and center. Forget stuffy upright chairs and ornate sofas. 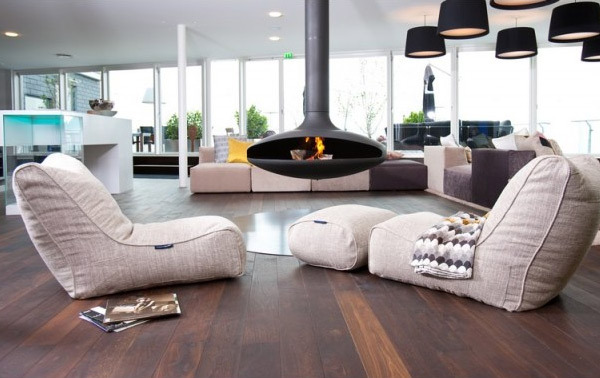 Outfit your family room with cozy beanbags to create a casual, intimate vibe in your family room. 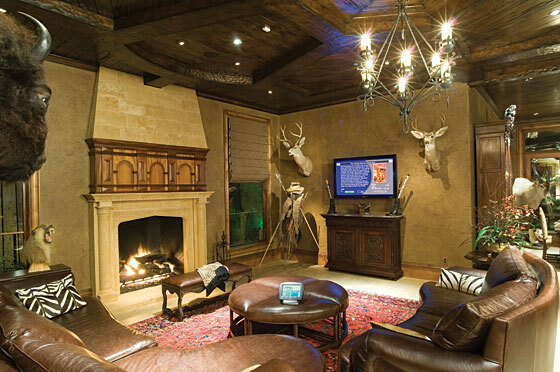 If your family spends more time in the woods during hunting season than you do anywhere else, then this family room absolutely needs to be an integral part of your home. To show off your skills without making your room feel like a natural history museum, stick to about five pieces of taxidermy and add to the big game theme by displaying pillows in animal prints and real fishing and hunting gear. Dark furniture in rich tones and smooth textures further adds to the ambiance of your space. 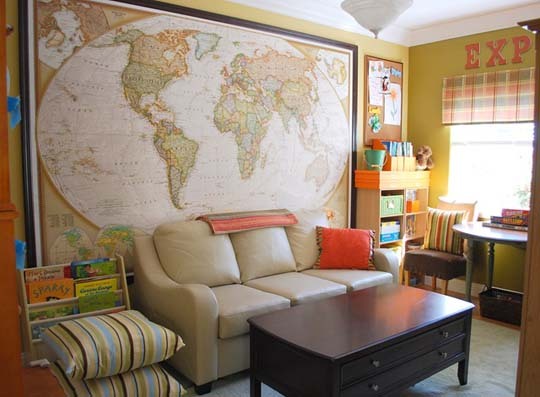 Keep the whole family together with this unique room that’s fun for both kids and adults. 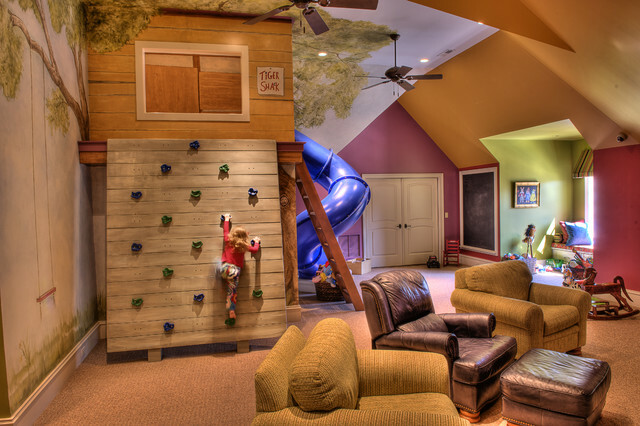 This family room features a visiting area for adults outfitted with cozy armchairs, but a variety of fun fixtures like a climbing wall, a slide, and a reading nook also make it a perfect space for kids. This room is the ideal space for families that love to spend time watching blockbuster flicks in the comfort of their own home. The warm tones and plush textures of the furniture ensure that there isn’t a bad seat in the house, while the shaggy carpet would be perfect for lounging and munching on buttered popcorn! This family room puts the emphasis on fun with a giant bookshelf lined with inviting and exciting reads and board games stacked underneath a coffee table for easy access. Walls as black as night beautifully contrast with light furniture and a colorful patterned rug to create a mood that’s mature and modern, yet enjoyable for all ages. A family room should be a place for loved ones to gather and create meaningful memories, yet many people only include a television as a form of entertainment in their family rooms. While this room includes an entertainment center with a television, it also contains organization-friendly shelves and cubbies for storing games, books, crafts, and other forms of entertainment that are more engaging for the family. There’s truly something for everyone in this bright and airy space, yet its layout keeps it from looking too cluttered or chaotic. Patterned pillows and an armchair in colorful hues add pizazz to this lighthearted family room. When the television isn’t in use, the cushioned area directly beneath the screen can conveniently be used as extra seating. While the décor on the shelves of the built in cabinet is contemporary-chic, the artwork surrounding the TV allows the children to infuse the room with their personalities, as well. From the time you were old enough to dress yourself, you have probably been familiar with the age-old rule that you should never mix prints and patterns. This print-crazy family room should be enough proof to convince you that the rule was meant to be broken. 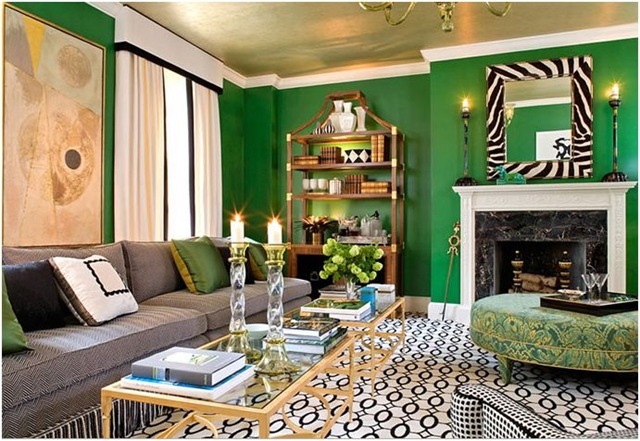 Solid green walls and basic white trim provide the perfect backdrop for lots of pattern play. This family room may keep it simple when it comes to furniture, but the colorful and script-adorned walls make it anything but ordinary. We love the idea of painting the ceiling in a bold, contrasting solid that draws the eye upwards. 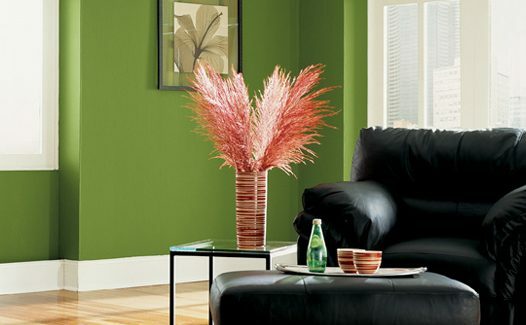 Picking a color can be difficult but you can consult a professional like F&B Painting for any and all advice you need. 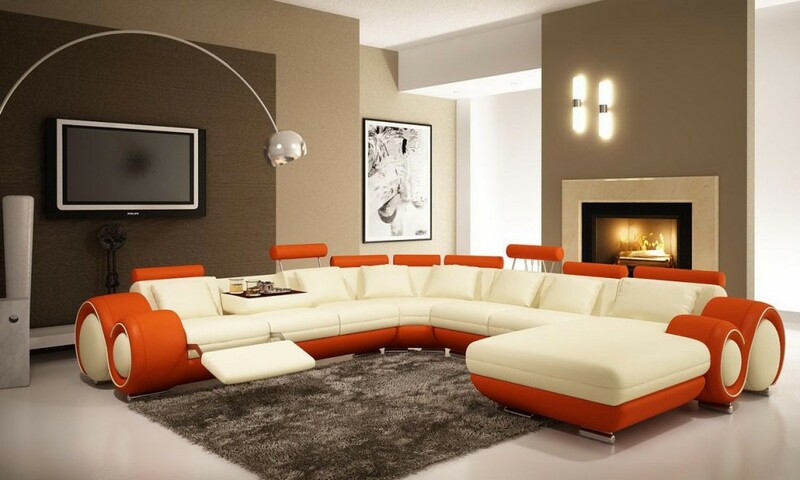 The futuristic sofa set and bright light fixtures combine with sharp architectural lines to create an ultramodern family room that feels as though it’s part of a revolutionary space age. The bookworms and flick fanatics in your family can finally coexist in one environment. 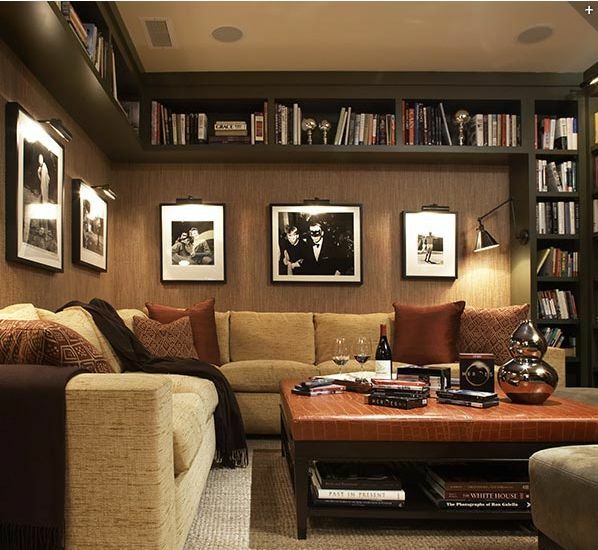 The contrast of dark shelving and furniture with bright lights mounted around the room creates an intimate environment in which your family could read or watch movies (or both!) for hours on end. Wood paneling dresses up the drywall in this family room and coordinates perfectly with other wood pieces in the room, such as an antique chest that is innovatively used as a rustic coffee table. Warm tones of brown and tan make the room feel cozy and inviting for the whole family. If you think you don’t have the space for a family room in your home, give a second thought to your abandoned basement! Ceiling-mounted light fixtures play off the off-white walls and gray paneling to create a brightened space, despite the fact that the room is technically underground. 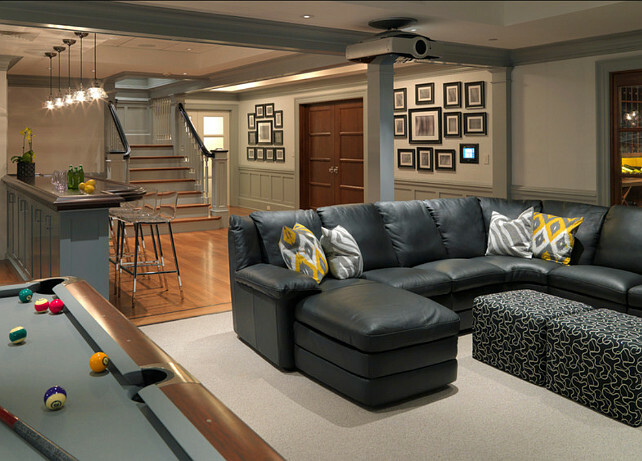 With a bar area, pool table, and carpeted section for watching movies on a luxurious leather couch, there’s something fun for everyone in this basement family room. The abundance of cabinets and cubbies in this vibrant family room is ideal for neat freaks, taking cleanup time from stressful to simple! With so much shelving and storage space, there’s a specific place for everything from DVDs to board games. 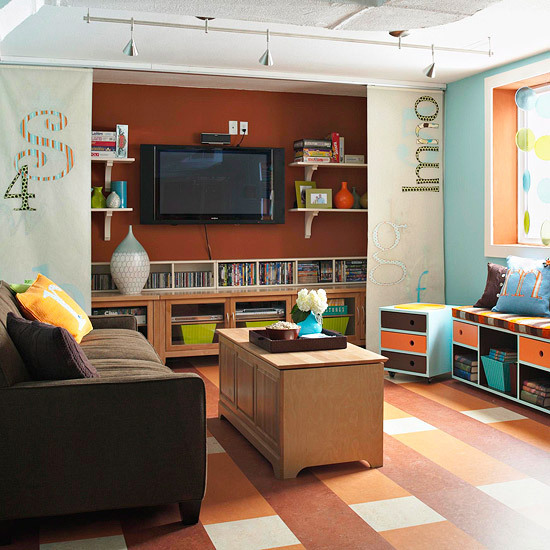 Warm, visually appealing colors and alphabet-inspired decals on the walls also make this room an especially great choice for families with small children.